MILW #01524 wooden caboose, fresh paint, roster shot. Oct. 1970. Ektachrome 35mm transparency. Philip A. Weibler photo. 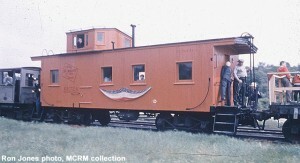 MILW caboose #01524 at opening day at Hillsboro, WI, May 26, 1962. Ron Jones photo, MCRM collection. MILW #01524 at Madison, WI in C&NW Yard after restoration by museum members. May 20, 1962. Ron Jones photo, MCRM collection. 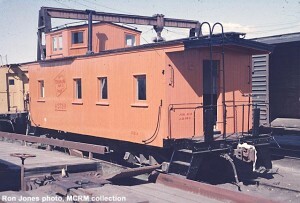 MILW caboose #01524 at Milwaukee Shops before delivery to MCRM. 1962. Pete Gorman photo, Ron Jones/MCRM collection. 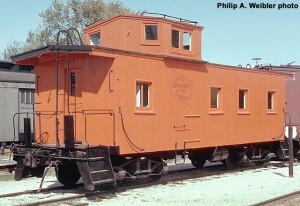 #01524 was the very last wooden caboose acquired by the Milwaukee Road. It was actually built by the Milwaukee Road in 1923 at their own main shops at Milwaukee, Wisconsin along with twenty-four sister cabooses for use on subsidiary Chicago Terre Haute & Southeastern (CTH&SE). The Milwaukee had acquired the CTH&SE only two years previously to access the coal fields in southern Indiana. The CTH&SE had a fleet of existing cabooses, but more were needed for increased business; the Milwaukee Road opted to build their own. 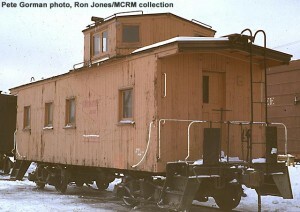 #01524 is a typical cupola style caboose with the amenities required for train crews: sleeping bunks, conductor’s desk, and coal stove for heating in winter weather. 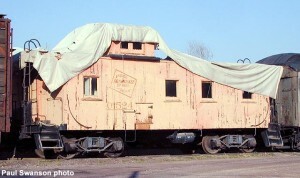 #01524 was donated to Mid-Continent in March of 1963, only the second caboose acquired by the museum. Museum crews restored the paint scheme #01524 wore on the Milwaukee Road at its retirement while the car was stored in Madison. Shortly after, it was shipped to North Freedom to meet up with other equipment arriving on the newly acquired property there. #01524 was used throughout the 1960’s to haul passengers on the museum’s train ride. It was removed from service in the mid-1980’s and is presently stored inside the Car Shop building awaiting funds to repair the roof, replace siding, and install new steps.